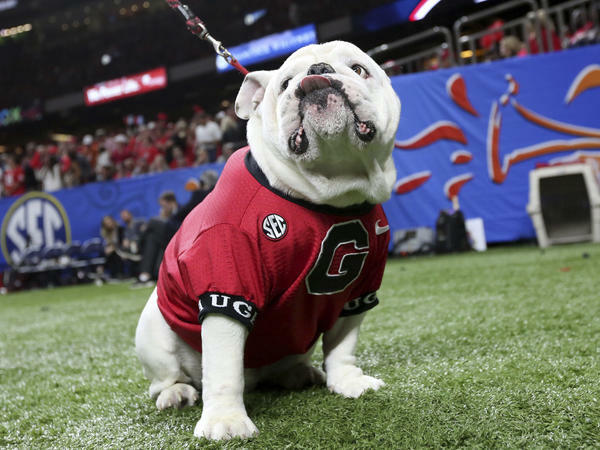 Uga, the University of Georgia mascot, sits near the sideline during the second half of the NCAA Sugar Bowl game against Texas in New Orleans on Tuesday. The Texas Longhorns mascot enters the stadium last September before a game in Austin, Texas. It is a philosophical question often pondered by sports writers and curious Redditors: If every college mascot were to fight each other, which would stand victorious when the dust cleared? Up until now, the question has been purely academic. But during the Sugar Bowl pregame festivities Tuesday night in New Orleans, viewers almost got an answer to one no-longer-hypothetical matchup. 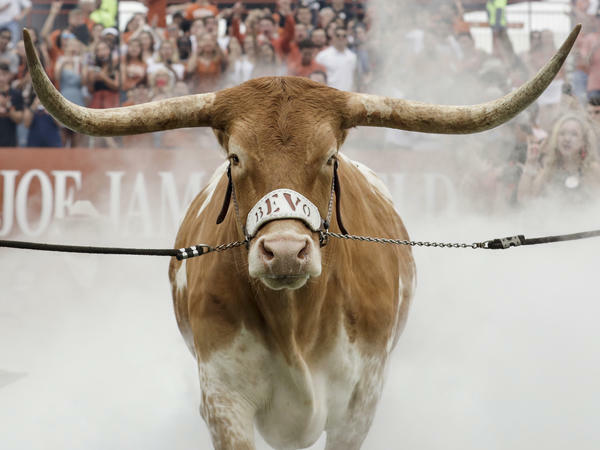 The University of Texas at Austin Longhorns mascot is Bevo, a longhorn steer weighing in at 1,600 pounds and armed with two spear-like horns that span 58 inches. The University of Georgia Bulldogs mascot is Uga, an English bulldog tipping the scales at 62 pounds. Uga has no horns, but he does wear a festive spiked collar. With just under an hour before kickoff, handlers were trying to arrange Bevo and Uga for a photo-op on the sidelines of the Superdome. Suddenly, and without warning, Bevo broke through the metal barrier separating the two mascots and charged toward the pup. Video of the melee shows Uga running for his life, as Bevo comes perilously close to hooking his tiny opponent (not to mention almost trampling several humans along the way). One of Bevo's handlers, Texas senior Patrick Dowell, told ESPN that the steer was "just going to say hi" to the little dog. John Baker, owner of the ranch where Bevo was bred, said that Bevo is actually "as docile as a lamb." Many on Twitter chastised Uga's wardrobe artists for clothing him in the school's colors: red and black. But the color red doesn't actually make bulls charge. Bulls (and all cattle) are color-blind; they charge the matador's muleta not because it's red, but because it's moving. The mascots' handlers were able to restore order, robbing interspecies speculators of the chance to know definitively who would win in a fight between a steer and a bulldog. As for the human matchup that took place afterward, the answer is clear: The No. 15 Longhorns handily defeated the No. 5 Bulldogs, winning the Sugar Bowl 28-21.